Yogaspace offers both a 4 week Introduction to Hatha Yoga workshop and a 4 week Introduction to Vinyasa Yoga workshop for beginners. Hatha Yoga is a moderate practice providing time and space for the mind and body to receive and respond. Vinyasa Yoga is a dynamic practice, inextricably linking movement and breath to create a deeply therapeutic effect. In both practices, students develop strength and flexibility while learning to consciously balance effort and rest. Which style you choose is entirely dependant on your temperament and what you are looking for in a Yoga class. For example, if you are an energetic person who enjoys alot of movement and you are interested in a more athletic or dance-like practice, we would recommend Vinyasa Yoga. On the other hand, if you are looking for a moderate Yoga practice emphasizing a slow, deep approach to stretching and strengthening, we would recommend Hatha. The other thing you could do, is try both. Please do note that we introduce the foundations of Vinyasa Yoga very slowly. These classes are suitable for everyone including those new to the practice of Yoga, individuals with movement limitations and anyone who suffers from chronic fatigue, adrenal fatigue or insomnia. Also a highly beneficial counter practice for anyone with an ongoing dynamic physical practice of any kind. These mixed level classes are suitable for all students. Emphasis is on alignment and breath detail with options for students to go deeper. Students are always encouraged to honour internal signals to slow down, take a break and digest as they increase understanding and experience. In All Levels Vinyasa classes, expect to sweat. Mysore Self Practice at Yogaspace is specifically designed to be accessible to ALL students. Here, students ranging from absolute beginners to advanced practitioners have the opportunity to work one on one with the teacher in a group context, progressing through the Primary series of Ashtanga Yoga at their own unique pace. These classes assume that students have previous experience in the specific style offered. We move progressively through sequences designed to prepare the mind and body for more advanced postures and core awakening work. Here we courageously explore self imposed limitations and playfully flirt with our edges. Expect to sweat deeply! These classes are suitable to experienced practitioners who are very comfortable in a level 1-2 class and interested in progressing in their practice. NEW STUDENTS: New students should allow should allow for 45 minutes to an hour for their practice and may arrive anytime between 6am and 7:45, keeping in mind, they must be finished their practice by 8:25 as another class comes in at 8:30am. This class fuses Vinyasa sun salutations, asana and pranayama with core strengthening Pilates and Barre exercise. A creative, challenging, mind body experience rooted in yoga, energized in pilates and influenced by dance conditioning. Hatha Yoga is a slow moving practice that encourages mindful embodiment. Postures are held long enough to feel the subtle dynamic affect of the breath and the small changes, shifts, and adjustments happening in your body. It is a practice of exploration and discovery through movement and stillness, where you can let go of ambition and insecurities in order to nurture a state of presence and self-inquiry. You’ll be pleasantly surprised how engaging it is to move slowly. All Levels/Gentle, Level 1 and Level 1-2. Assisted by the use of props, poses are held for longer periods of time. This enables us to let go of long-held tensions that manifest both physically and mentally. Our Restorative Yoga classes incorporate soothing music, essential oils and lots of deep hands on assistance. Our popular pre-registered Therapeutic Yoga class is an amplified Restorative Yoga class offering 1 practitioner for every 2 students – a must try for all! Gentle. This meditation class begins with gentle movement alongside a strong focus on a connecting with the breath to increase body awareness. We will move into stillness and settle into our meditative position of choice, where we will explore one meditation technique per session. The meditation practice will start guided by the teacher, who will slowly invite students to explore on their own ~ but never be too far away. Meditation techniques explored in these classes include mantra, mindfulness, visual, and loving kindness, to name a few. As well, participants will be introduced to Restorative yoga, a deeply relaxing and nourishing style of Hatha yoga that incorporates the use of props for support in the poses so we may hold poses for longer periods of time and focus on calming the nervous system. This course prepares you to comfortably and confidently attend any of the Hatha Yoga and Restorative Yoga classes on our schedule. If you’re interested in taking Vinyasa Yoga classes, we highly recommend you take the Introduction to Vinyasa Yoga course. This fun and informative 4 week introductory workshop is for absolute beginners as well as experienced students interested in sharpening their skills. Vinyasa Yoga is a dynamic practice in which each movement is linked to the inhalation or the exhalation. Here, we slow it down and we break it down. You will learn the fundamentals of Vinyasa breath work, alignment of the foundational postures and when to inhale and exhale. Each week will build on the previous week with tons of individual attention and lots of time for questions. 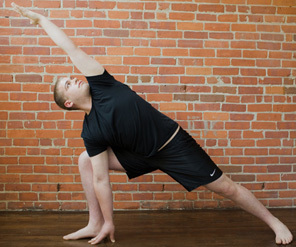 Learn the foundations of Vinyasa Yoga at an easy pace, from a master teacher. Gain confidence and head out safely onto our drop-in class schedule. Beginners (and experienced students interested in sharpening their skills).